It has been a long time since I last wrote a blog post, way over a year in fact, so this is a round-up of my 2017! There were no big swims for me in 2017 and what many of you may not know was that in February I found out I was pregnant. I then suffered from hyperemesis for most of my pregnancy but during bouts of feeling well I got out and managed to get some swimming in – it was one of the very rare things that didn’t make me feel or be sick. So instead of doing any big swims and enduring long training swims I decided to have some fun with my swimming. I was interested to see how my pregnancy would affect my swimming and people’s perceptions of a pregnant woman swimming in colder waters or in the sea. I also enjoyed doing some talks about swimming the Channel and the need for commitment, determination and courage. My first two talks were in March, firstly in a primary school and then the week after for International Women’s Day, completely different audiences but both with very similar messages – put your mind to something and go out and achieve it no matter what barriers are put in your way. In April I enjoyed some swims at both my local lido Tooting Bec but also headed back to Brockwell lido where back in my late teens I worked as a lifeguard for a summer and also taught swimming, I always love going back there especially as it was a beautiful April day. It was my first time swimming in the cold water whilst being pregnant and I was 3-4 months pregnant. I had spoken to my midwife about swimming in colder temps and was pleased with her positivity about it ‘if it’s something you have been doing then carry on doing it, but if you start shivering in the water then get out’. I had heard stories in the past of midwives and doctors advising against it so it was nice to hear it was okay. Doing reasearch there is very little advice on swimming in open water whilst pregnant – only information on hot water and saunas etc and general exercise. I remember being cautious first time I got in, getting my legs warmed up first before getting my stomach in, but once I was in I was away swimming as normal and really enjoyed it. At this point I didn’t look pregnant so there were no comments from anyone as to whether I should or shouldn’t be doing swimming. From the colder climates of London’s lido’s I then headed over to Dubai for a week to enjoy some much warmer swims in the sea, having grown up there I always enjoy my swims in the gorgeous clear water. Whilst swimming however, I did start to notice that I was getting tired more easily and was out of breath very quickly especially in the rougher seas so did a few 30 minute swims rather than longer swims as I would have done before. All enjoyable though as always, but it reminded me that perhaps I needed, whilst pregnant, I might have to take things a little easier. At the end of May, Tom and I decided to head down to Rye for a few days and tie in a trip over to France as I hadn’t had a chance to see my landing of my English Channel swim from land side. We just drove over for a few hours and headed to the lighthouse at Cap Griz Nez, it was a miserable day and as I looked down to the rocks where I landed and then over towards England I still to this day can’t believe that I made it. I remember the pain but the determination and I will admit I had a little cry to myself as it all came flooding back. It was a reminder to me of how far I had come over the years to achieve something pretty special. London Fields Lido – I managed to fit in a trip here for a swim before it closed for renovations for the summer, I believe it is about to finally reopen after many delays. It is a lovely pool although can be extremely busy. It is 50m and heated all year round. Lake 32, Cotswolds – I went to visit Kerry in July and we headed to one of the many lakes there for a dip. Again another great facility open to open water swimmers and triathletes to use at certain times to swim in with marked out distances of 400m, 750m and 1500m. The water was lovely and clear and not too weedy which was nice. Wycombe Rye Lido – A 33m heated lido, Tom my husband and I visited here having not been before. It was a beautiful sunny day and we got there before all the families and sunbathers. Again great facilities and a lovely little cafe to grab a smoothie afterwards. Hillingdon Lido – This is a 50m unheated Lido which used to be known as Uxbridge Lido. Brian joined me here and we had the whole pool to ourselves, I really hope that more people start using this pool not just on the sunny days, it is such a great facility. Guildford Lido – Guildford is a 50m lido which is heated to about 25 degrees during the summer months and during the winter heated to about 10 degrees. One of my favourite retreats and often quieter than many other heated lido’s but used well. Hampton Pool – A pool which is open and heated 365 days of the year and is 36m long. I have been heading here for a few years but can be very busy at times, it is even open on Christmas Day but unless you go very early you won’t get to swim much just wallow in the water with many others. Oasis Lido – In the heart of London close to Tottenham Court Road you will find a little piece of paradise, the facility boasts and indoor and outdoor pool. The lido is 27.5m and heated all year round and even includes a few palm trees to really give that tropical feel. Another pool I have frequented many time over the years and one I always enjoy going back to. Crystal Palace National Sports Centre – This was the only indoor pool I swam in during my pregnancy – I swam in the 50m racing pool but there are 3 other pools at the centre as well as many other facilities. As I swam at the various locations above through my pregnancy I received a variety of reactions and the closer I got to my arrival date generally the more negative feedback I got. Things such as ‘should you be tumble turning’, ‘the cold water could harm your baby’, ‘I don’t think you should be swimming as much as you are’ I often heard and were always greeted with a smile The funniest reaction I found was from other lane users when I got into the fast lane. I always looked to see where my speed might fit and on the whole it was in the fast lane, and generally I was the fastest person in the lane. I used to find that people didn’t like me being in the lane and would often push-off in front of me or try to keep up with me as if trying to prove a point. I did enjoy overtaking these types of people, just because I am pregnant doesn’t mean I can’t swim! I did have to adapt my sets and rest a bit longer than I previously would but other than that there was nothing wrong with my swimming! When I was 7 months pregnant Tom and I decided to have a staycation and we headed on a little road trip for 2 weeks. Our trip took us to Devon, Dorset, Cornwall and Somerset and included a few swimming trips. A quick dip in the sea in Lyme Regis, many swims from the beaches in St Ives, a day at Jubilee Pool and we finished with a swim around Burgh Island. Jubilee Pool and Burgh Island were places Tom and I had wanted to swim for sometime and were purposefully added into our holiday agenda. Jubilee Pool is an art deco fresh sea water lido based in Penzance. It is open through the summer and is triangular in shape so a nice change to the usual rectangular shape many pools take. It was a beautiful day when we were there and the water was lovely, a nice change having a salt water lido as well. Whilst I was there, there were many pregnant women enjoying the pool, one who was even a week over her due date. It was nice to see and seemed to be celebrated rather than frowned upon which was great and a nice change. You’ll find Burgh Island opposite Bigbury on Sea in Devon. It is famed for its hotel which is only accessible via foot or tractor at high tide and over the years many swimmers have swum around it. We met up with a friend of mine Sarah whom I had met in Majorca a few years back whilst on a long distance training camp and is a fellow Channel swimmer. Due to the timings we had to swim at low tide and went round it anti clockwise. It was quite rough as we swam round with a large swell but as it had been a while since I had swam in conditions like this I relished it. There had been some concern from friends and family about whether I should be swimming in the sea without support especially as when you get around the back of the Island there is no exit points. However, I had taken a few safety precautions (which I also would have taken if I wasn’t pregnant). These were to research when high and low tide were and when the best time to swim it would be, speak to the lifeguards beforehand about the conditions and weather as well as letting them know when we started and when we arrived back as well as taking a tow float with me. It is a wonderful swim and I definitely recommend it. If you don’t fancy doing it on your own Swimtrek do a trip with support as well as various charities who run charity swims around it. At the end of August I was asked to be interviewed for a short film that Shimnix Films were producing about ‘The Space Outside’. My interview focused on swimming outdoors whilst being pregnant. It launched on the 1st January and can be viewed on the link above – the second film in the series. It was lovely to be included amongst so many inspirationally adventurous women. In September Tom and I headed back down to the south coast to join Adventure Uncovered for a swim through Durdle Door and round to Man O’War and back again. The beautiful summer sunshine was out and Tom and I joined a group of other people including the Wild Swimming Brothers for a really enjoyable swim. At 8 months pregnant it was nice to be off my feet and enjoying the weightlessness of swimming. There was another pregnant women in the group and she had concerns about swimming in the sea and cold whilst being pregnant. It was nice to be able to share my experience of the past couple of months with her and assure her that swimming in open water whilst being pregnant was completely safe. There is such a lack of advice anywhere on the subject and many pieces of it are very much on the cautious side rather than the ‘carry on as before’ side. One of the other things I really enjoyed this summer was helping Outdoor Swimmer with some reviews, namely a swimming costume review and kit review. Outdoor Swimmer is a great magazine for open water swimmers, a great read if you are keen on enjoying the water in the great outdoors. During September I had decided having been so ill through my pregnancy to work part-time so had 4 day weekends, I was able to put this to good use and head down to Tooting Lido and help the team out trying out various pieces of kit. Some pieces of kit have come such a long way and it was fun seeing how different pieces are able to aid training. The last thing I did swimming wise was just two weeks before my due date. I had been asked to speak at the WEConnect International Europe Conference at the Barbican. I talked about my Channel swim and the challenges that came with it and the courage and determination that came with taking on such a challenge and the similarities to that of being an SME. It was such a nice way to round-up my year before my next challenge – becoming a Mother. In October my little boy, Buddy, was born. I had to have a caesarean so 2 months in I still haven’t been able to swim but am hoping to soon… so watch this space! However, next week I start the journey of my son starting to enjoy the water as he starts his swimming lessons. I am looking to being in the water again, however, this time I will be there supporting my son as he builds his confidence over time in the water and I only hope he enjoys it as much as me. I was interviewed by Tough Girl last year following my channel swim. This year she produced this sketch note which is great summary of my swim Take a look. Two years ago I remember seeing a friends Facebook post about a new swimming challenge which was being held in the Isle of Scilly, it looked amazing and I added it to my ever expanding swimming bucket list. I was reminded again about it last year when another friend did it and the photo’s again looked simply divine. So when the Scilly Swim Challenge opened their entries for this year I emailed a few friends to see if anyone wanted to join me. The swim had become so popular already that Kerry and I found ourselves on the waiting list within only twenty minutes of it opening. Luckily for us just a few days later we were both offered places. The challenge is made up of 6 swims and 6 walks over one day, this year they also ran an alternative option which was for people to do the challenge over two days instead of the one. What we hadn’t added into the equation was the challenge of actually getting to the Isle of Scilly in the first place, for those of you that don’t know it is off the coast of Cornwall about 28 miles out from Lands End. Just a month before we were frantically trying to find somewhere to stay and work out our easiest and most time efficient way of getting there. It wasn’t easy as ferries are only once a day and although planes fly from Newquay, Exeter and Lands End they aren’t cheap. We opted to drive down to Lands End and then take the 15 minute flight from there to St Mary’s. We needed to register on Friday before 4.30pm at Portmellon beach and then the briefing and acclimatisation swim would be at 5.30pm. There were about 130 taking on the challenge with about 15-20 of us swimming without wetsuits, although I believe some did put them on as each of the swims progressed on the actual day. The water temp was about 14.5 degrees so we were hoping for a bit of sun so that we could warm up on the walks between swims. 7am on Saturday morning we met at the meeting point on Portmellon beach ready for the walk to Bar point on St Mary’s Island to the start of the first swim. Swimmers had been divided up by speed into Red, Amber and Green hats and the idea is that each pod goes off together and then kayakers support each group as they make their way across to each island. Throughout the day there would be approximately 15km of swimming and 10km of walking. Once we arrived at Bar point, St Mary’s we arranged into our groups and got our bags onto the boat so that they would meet us on our arrival at St Martins. For the skins swimmers such as myself they had an extra facility which was bags which you could put your dryrobe or towel into that would be there as soon as you got out of the water to help prevent too much cold shivering. As we started the 2.8km swim to St Martins it was really overcast but the water was lovely flat and we soon arrived at Higher Town Quay – St Martins to the supporters/volunteers and our bags. We had a short walk up to what appeared to be a village hall where we were greeted with soups, bacon/sausage sandwiches and warm drinks… I wasn’t sure we deserved it just yet but it was a lovely welcome! Another little walk down to Lower Town Quay where we would start our swim to Tresco, this was about a 2.3km swim but seemed to take us longer than the longer first swim. The water was still flat and the sky overcast but the water was still feeling warm and the shivers hadn’t started yet. We weaved in between some smaller rocky islands at the beginning and it was difficult to know where we were heading to other than follow the kayaks. As we got closer to our landing point on Old Grimsby Beach in Tresco and started swimming parallel to the shoreline I could see that I wasn’t swimming anywhere very fast and there seemed to be a current heading not with me but against. Eventually we landed on the beach to the big smiley face of our pod leader Dawn who was ready to mark us in. The group who left after us came flying in from a different angle and had obviously enjoyed the current in their favour. After another short walk up to the community centre we were treated to lunch – a variety of pasta’s (including Gluten Free for the annoying people like me with difficult eating requirements), cakes, chocolate, banana’s, hot and cold drinks. We had an hour here and to my delight the sun had come out so an opportunity to work on my summer open water suntan! With our tummy’s full we headed down to New Grimsby Quay, passed over our bags to the boat to meet us after a quick 600m sprint over to Bryher by Church Quay. As we waited for the swim someone remarked to Kerry and I that we looked like we were on our summer holidays standing there in our costumes enjoying the sunshine. This time all pods were going off together for the short swim so there was a little argy bargy as some of the swimmers raced off wanting to be the first on the beach. After arriving we walked up to the church and were treated to more cakes (including delicious homemade gluten free brownies – thank you to whomever made those), there was time again to enjoy some sunshine until we started the walk over to Rushy Bay. We were treated to amazing views, as we had for all of the walks, but as we came around the corner we all looked a little worried as we saw the waves crashing fiercely upon the rocks in the distance. We turned another corner and arrived at Rushy Bay, like all the others a beautiful white sandy beach. The water was definitely looking rougher than the calm waters we had been swimming in previously. This was the start of the long swim which would end in St Agnes Quay, with a little stopover to walk across a sandbank on Samson about 1km away. We had to swim around two large rock formations, one had attracted a host of cormorants. Our pod all gathered again on the sandbank before the short walk across and then the start of the longer swim of a further 5km. Between the islands we had experienced patches of long weeds which enjoyed wrapping themselves around your arms, torso and legs… without a wetsuit it felt very slimy but luckily made it easier to swim through although at times I would put my head up and pull myself through them. This was no different, a large area of weeds until we headed out to the open sea to swim over to St Agnes. During this swim you could only sight off the kayaker in front as the swells were reasonably big and you couldn’t see St Agnes, when we could it didn’t seem to be getting closer for quite some time. Eventually I could see 4 bright orange t-shirts standing at the end of the quay ready to welcome us in… for you got it… more warm drinks and cake!! There was definitely no going hungry on this challenge. For the first time during the day I had started to feel a little cold towards the end of this swim and the shivers definitely started when I got out.. it made me feel a little better when the wetsuit swimmers couldn’t keep their warms drinks in their cups due to the cold shakes either. A few swimmers were pulled out before the end of this swim as it had been taking them too long, were tired or just didn’t fancy it anymore. We just had one more swim to go and all swimmers were given the opportunity to board a boat back to St Mary’s (the Island where we had started our day). A few swimmers took up that offer as the swells according to one of the kayakers were above their heads – in fact at one point during the swim I heard a large ‘wooohoooo’ as one of the kayakers next to me started surfing them. The last swim was about 3km but again you couldn’t see the finish due to it being around the corner and then another into Porthcressa beach. Not being able to see your final destination or know where to sight to I found difficult at times but luckily the kayaker I was following had a large wide brimmed hat that I could always see. The last swim was tough as the swells were coming in from the side but as I turned the corner to the last part of the swim into the beach the water was incredibly calm and I flew into the beach (over more weed). As I came out onto the beach many supporters were there cheering us in, a mixture of people who were there supporting friends and family but also locals and those on holiday (who were bemused as to why anyone would want to do all that swimming in one day). I arrived onto the beach to a big hug from Dawn our pod leader – a lovely welcome after what had been 12.5 hours since we had left earlier that day. A quick change and then we headed to the pub for a celebratory drink and steak dinner! The next evening (Sunday) Scilly Swim Challenge organised a ferry over to St Martins to Karma Hotel where drinks and BBQ awaited and was a great opportunity to catch up with new swimming friends and chat about the swim the day before. A really lovely evening enjoying burgers, Pimms, talks of swims around the world and listening to live music. I cannot praise this swim enough, for many reasons. It is in a beautiful location and the local people on the Isles couldn’t have been more friendly, supportive and a complete pleasure to talk to. At times you could have been mistaken to think you were in the Caribbean. The event was run incredibly well and had obviously learnt from the two years before. Every time we landed on the beach our bags were there and there was drinks and food galore (even for a gluten free pain like me!) – I am sure I put on rather than lost weight on this swim. Lastly all those helping on the day always had a smile on their face and were incredibly supportive, that includes the kayakers, pod leaders, those providing food/drink etc – so thank you to everyone. Another swim ticked off my bucket list. It is also a challenge that both skins and wetsuit swimmers are able to join in and is promoted as a challenge rather than a race. So if you are looking for a timing chip and a winners medal then perhaps this isn’t the swim for you (you do get a t-shirt though :)). Swimmers are able to wear fins for this swim too – I am not sure I personally agree with this and having been kicked in the face on a few occasions by some it made me disagree more, however, it is an option if you aren’t keen on swimming without them and want an extra boost. Throughout the swim I was asked by many wetsuit swimmers was I not cold? I don’t think that I was any colder than any wetsuit swimmer, and in fact was probably warmer than some. Most of the skins swimmers had big swimming pedigrees including solo Channel, Catalina, Manhattan (to name a few) swims under their belts and therefore had been training without wetsuits for years so wasn’t really a problem. My only advice before booking this swim would be to look into the accommodation and transport to get there. The flights aren’t cheap and only fly from Newquay, Exeter and Lands End (and are often cancelled – our homeward flight to St Ives was cancelled in the morning and we had to get the ferry late afternoon meaning we got home at 1am instead of 4.30pm and people had had flights cancelled on the Friday night meaning they missed the first swim in the morning) and the ferry only leaves once a day from Penzance. The restaurants also get booked up very quickly, we tried to get into all the restaurants and pubs for dinner on the Friday night for an hour until we managed to find a space so ensure you book up in advance. Next years event is currently planned for the 2nd September with the two day event planned for the 5th & 6th September. Make sure you sign up for the newsletter so you can enter as soon as it opens (around October/November) – as I mentioned before it sold out in twenty minutes for this years event. You can find out more information on their website here. As part of our honeymoon Tom had surprised me by booking us in for the Sharkfest Alcatraz swim. The email arrived into my inbox telling me I had booked onto the Alcatraz swim just days after a great white had been spotted ‘playing’ with a seal by the ferry port. So as I packed to leave to Vegas, followed by our California Road trip from Los Angeles to San Francisco I took the brightest cozzie I could find and advised Tom to leave his wetsuit at home so we looked less like seals! There wasn’t many training opportunities whilst we were away but we did have a chance to have a quick dip in Tenaya Lake in Yosemite – a beautiful location and setting and was lovely to cool off and have a short ‘acclimatisation’ swim! We did also do a few laps between cocktails in Vegas in one of the pools at Caesars Palace but not sure I can count that! We had been staying Santa Cruz, where Tom had managed a quick dip, and so after the Friday night concert we drove up the coast to the outskirts of San Francisco where we stayed for the night. It was incredibly misty when we arrived and when we woke up and drove down at 6am the next morning it was still the same. When we arrived to register we still couldn’t see the Alcatraz so there was some question as to whether the swim would be able to start. From the registration there is a walk to the Ferry port, as 900 of us in swimming costumes and wetsuits walked to the ferries the tourists out for their early morning strolls and breakfasts were very bemused! We boarded the ferries and headed out to Alcatraz island all hoping that the swim (Sharkfest) didn’t live up to it’s name. As we neared Alcatraz all the swimmers started jumping off the side of the boat and headed over to the start of the swim – a line of kayakers. As we neared the mist lifted and we could see the mainland and where we would be finishing. As we jumped into the water, 2 of very few without wetsuits the water felt fresh – they had said that it was between 14-15 degrees. I waited at the back with Tom and when the horn went off we went. The swim is only 1.5 miles but due to the strong currents (hence why the prisoners were never able to escape) unless you aim for the right place then you get swept past the Aquatic Park where the finish is. I checked Tom was okay and stopped a few times to check he was on his way and then decided to head off. I completely sighted wrong and went too far to the left and ended up swimming along the Aquatic Park wall for far too long but after 48 minutes I arrived safely on the beach to the crowds who were cheering in their loved ones. Mine was still out there somewhere, so I went and got changed and grabbed my camera to get some snaps of him finishing – luckily by not wearing a wetsuit he was much easier to spot. We were two of twelve Brits represented at the swim and people had flown from all over including Australia to come and swim in this iconic swim. It turned into a lovely afternoon as we cheered in the last of the swimmers. We grabbed some lunch and then carried on with our honeymoon festivities – a night at the ball game watching the Giants win! There are many Alcatraz swims and triathlons organised throughout the year, if you find yourself out there have a look and see if you can find one – definitely an iconic swim to tick off the bucket list! Back in April Kerry and I flew to Spain to attempt to swim across the Strait of Gibraltar and I have been meaning to write it up since then… however, planning my wedding, being made redundant, going on honeymoon and finding a new job have meant I have been a little busy but I have got to it now! Kerry and I flew out on Friday 8th April to Malaga airport and had a car booked for the week. Like the English Channel you are given a week slot and hope that the weather is kind to you at some point of the week so you can get out to attempt the swim. Our slot was the 9th – 15th April. Some quick facts about the swim. 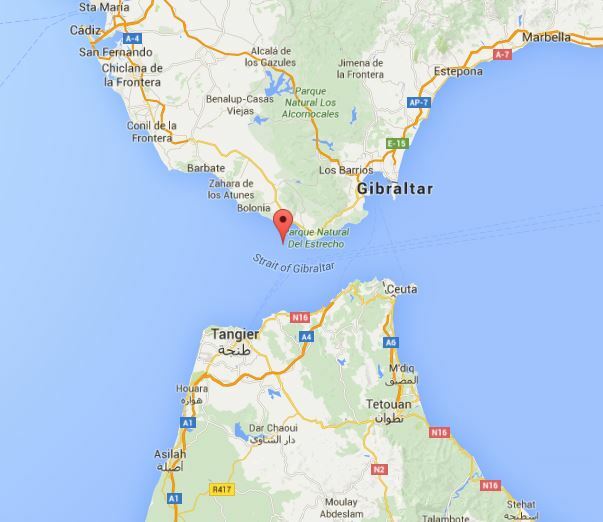 The swim starts in Tarfia in Spain (not Gibraltar as many assume) and finishes on the coast in Morocco. The distance of the crossing can be between 16.5 & 22km depending on the strong current. Crossings are usually attempted between April and October and the temperature of the water can range from 14-22 degrees during this period. We landed in Malaga at about 8.30 and called Rafael who runs the Strait of Gibraltar Swimming Association, it was then he mentioned there was a ‘high possibility’ that we would be swimming in the morning and to call him again when we got to Tarifa. There we were at 1am having our briefing in his office in Tarifa and told to meet at 10.30am the next morning in the harbour just in case we could go. Hardly the best of preparations but given what the wind is like in the area – big kite surfing destination – we knew that it may be our only opportunity that week so we had to take it. After a quick supermarket trip in the morning, prepping all our feeds and a quick journey in the car to the harbour the next thing we know we are being told we are off and to get ready. We were to be taken around to the lighthouse where we would start by boat and then we would follow a boat whilst we swam and have a RIB next to us which we would feed from. We didn’t take our own crew with us and had agreed with Rafael that the guys on the RIB would feed us. We had prepped them that we only wanted to feed every hour and we stuck with the CNP mix that we had both used for our solo Channel swims. Unlike the Channel you are able to swim the Strait of Gibraltar as a tandem solo, therefore we would both be recognised as having done the swim solo but swam next to each other. The day started lovely and sunny and calm, as we jumped in I was reminded that I hadn’t swam in cold water since my Channel swim back in August (8 months prior), the water was 14.5 degrees. Luckily after 5 minutes or so and with the sun on my back I was okay and didn’t feel the cold through the swim at all. We hadn’t been sure how long it would take but as we started swimming we could see how strong the current was, which would determine where we would land. Within about 30 minutes the lighthouse which had been so close was all of a sudden miles away. Funnily when we had our first feed we both mentioned it, it was that noticeable. About halfway into the swim the wind picked up and the swell and waves got so big that for much of the last part of the swim although we were swimming next to each other we didn’t really see much of each other as we were hidden by the waves… however, it was fun surfing them. As we approached Morocco the boats stopped and we told to swim in to shore and clear the water. There were a lot of rocks submerged in the water so we weaved in and out of them as came into shore and also avoided the fisherman to the left of us, we didn’t fancy becoming dinner! However, just as were trying to clear the water we saw two Moroccan’s come running down the mountain in front of us screaming. And in Kerry’s words “they didn’t seem to be shouting ‘welcome to Morocco'” I had heard the whistle to confirm the finish of our swim and we quickly tried to avoid the rocks to get back out and not get knocked over by the waves – which of course I did. In the meantime Kerry had managed to pick up two ‘pebbles’ and once we’d cleared we laughed in bewilderment at what had happened! Who knows what they were shouting but we hadn’t been that keen to wait and find out. We climbed back on the boat and were told our time of 4 hours and 14 minutes (we covered 18km in that time) which we later found out was the third fastest British female time and we became the 517th & 518th people and the 105th & 106th women to have swam it (without wetsuits). It was a pretty uneventful swim, we didn’t see any marine life which is often seen, we didn’t have any injuries, we landed and got back in one piece. However, it was a really enjoyable swim. After the drama of my Channel swim it was nice to see a smiley face every time I breathed, have someone to have a quick chat with during feeds and to just enjoy a swim. It is a great first swim if you are looking for a long distance sea swim that is challenging but is smaller than the likes of the English Channel. So that was Oceans Seven number 2 ticked off! Who knows if I or Kerry will ever do the others but we can be part of a small group of people who have done two of them! If you are interested in doing this swim you will need to register with ACNEG , they are a bit slow on the admin side of stuff but were fantastic when we were there and we felt very safe during our swim….get in touch if you have any questions about the swim. 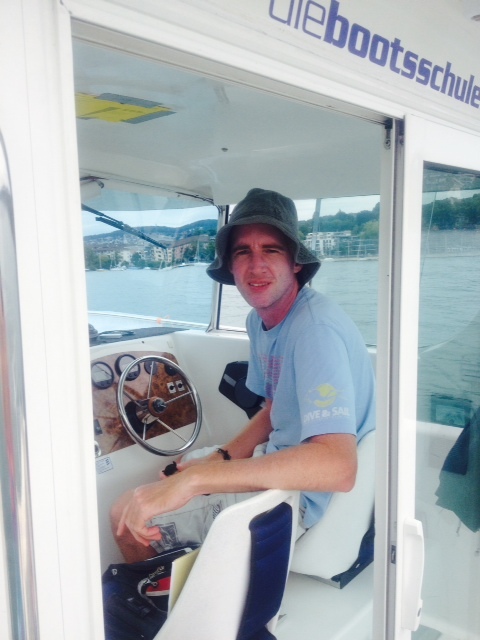 Since the day after my Channel swim I have been asked by countless people…what next? At that point there was nothing, I was happy to have crossed the Channel successfully and was looking forward to not having to get up early at the weekends and to spend some time with Tom and my friends & family. I have only done one training session since my Channel swim and have enjoyed doing other things such as spinning and pilates at the gym as well as a holiday to Tobago. But that is soon to change, now I am able to share my answer to the question.. what next? Next year I have two swims booked, both with Kerry my Channel training buddy. First one will be in April when we will attempt to swim across the Straits of Gibraltar from Spain to Morocco. We will be able to swim this side by side and will of course be doing it without a wetsuit. The water will be around 16-17 when we swim so similar to that of the English Channel but it won’t be as far. Many of the challenges from the EC will be valid here as well as strong currents. We have also booked to swim around the Isle of Scilly’s in September. 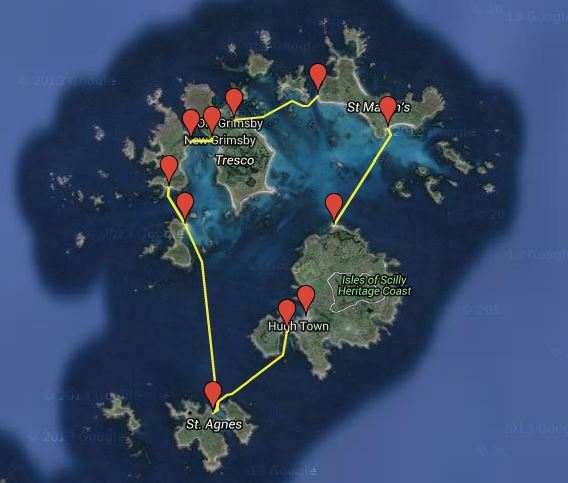 We will swim and walk our way across the Isles – 6 swims and 6 walks (15km of swimming and 10km of walking) over the day. 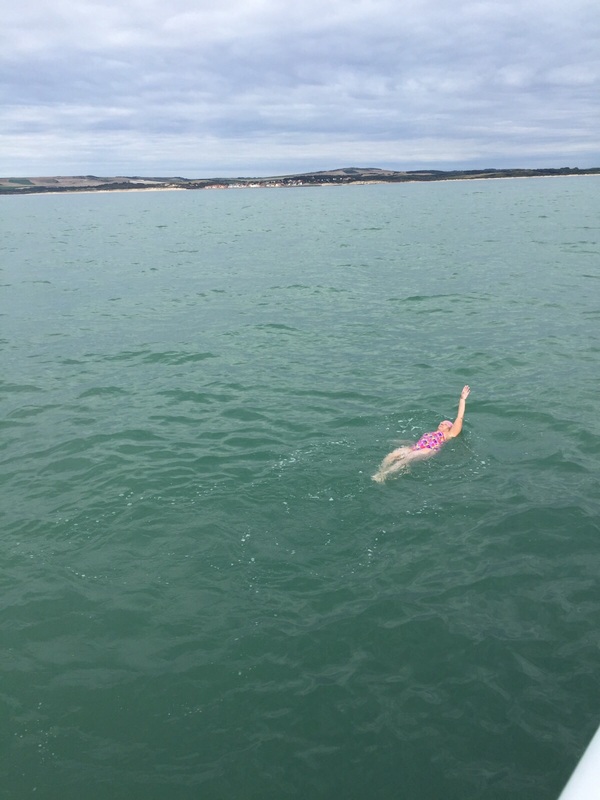 Today marks 2 months since I swam the English Channel so I thought I would write a quick blog on what it has been like since and what I have been up to. The days after the swim were very surreal and actually still to this day I find it hard to comprehend that I swam for over 17 hours. It was never something I had planned for or even thought I would have to do but I did and that is the most important thing. I haven’t swam since as the pain under my shoulder blade still shows from time to time and I also have torn a smaller muscle in my glutes which is still giving me some grief but to he honest it has been nice not to be swimming and taking some down time from it all. It has been nice not getting up early every weekend morning and having time to catch up with friends and family as well as being lazy from time to time. Things I didn’t do much of over the summer. I will be back swimming soon but for now I am enjoying the rest. 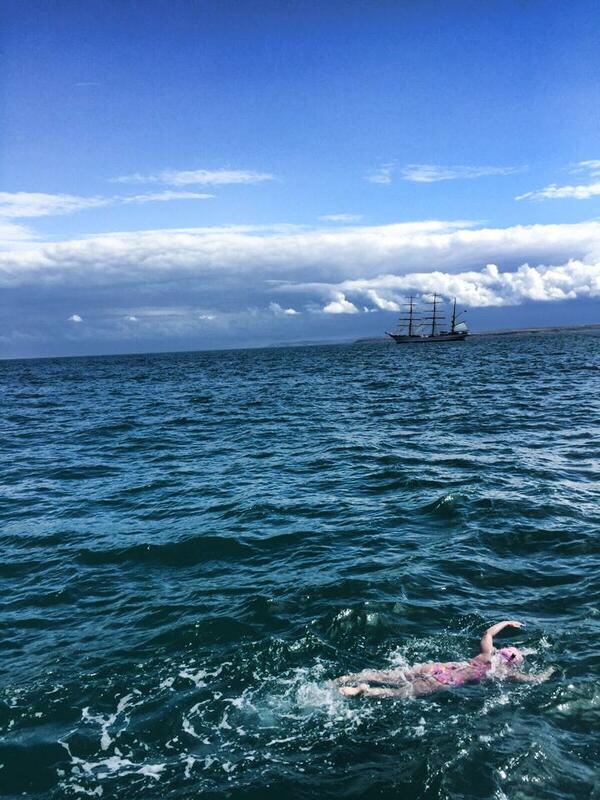 I have been astounded by the amount of money I have raised through swimming the Channel. For the Royal Marsden I have raised, thanks to so many generous people, £8,060 (£9,700 with gift aid) bringing my total for the last three summers of swimming fundraising to over £18,000 for three great charities (Aspire, COSMIC & Royal Marsden). I received a wonderful letter from the Head of Breast unit and another from one of the lead Professor’s in cancer research at the Royal Marsden thanking me for all the money I have raised for them which was so nice to receive and so pleased to know that the money raised will go towards ensuring a brighter future for others. It has made it all worthwhile. One of the other things I had wanted to do after swimming the Channel was to inspire others, I truly believe that if you are going to take on big challenges that you should do something with it and for me it is to inspire people to inspire others by doing things slightly out of their comfort zone. Life is too short for all the negativity in the world so if I can help make some small change then I’d feel pretty happy about that. Through the power of social media this started soon after my swim when I was contacted by Stylist online to talk through my experience, of course like many things it has been edited with some exaggeration but was some great coverage which helped to raise funds but also inspired a few to do something. You can read the article here. Next was when I was contacted by Sarah from Tough Girl Challenges asking if I would mind doing a podcast, the idea being that I would talk about my Channel swim but also about how people could get into swimming. It was really fun and hopefully I have given people some practical ways to be able to get into open water swimming. You can listen to it and some really inspiring talks on the Tough girl website I must admit I did find it quite funny being interviewed when the likes of Olympic Marathon runner, Liz Yelling and Gale Bernhardt, the USA Olympic Triathlon & Cycling Coach has been previously been interviewed. Thank you Sarah for asking me to join a group of inspiring women. A few weeks after the swim an old school friend had contacted me to see if I would go and do a talk at her company and then one of my companies clients contacted me to see if I would do a talk about my experience at their 15th Anniversary celebrations. I have really enjoyed doing these and the feedback from people has been amazing. I really wanted to concentrate on the power of courage, determination & commitment and what you can achieve through these three attributes. I believe these are the key things that helped me to my success. I really hope that I have been able to make a small difference and it seems from some of the feedback that I have which is great. 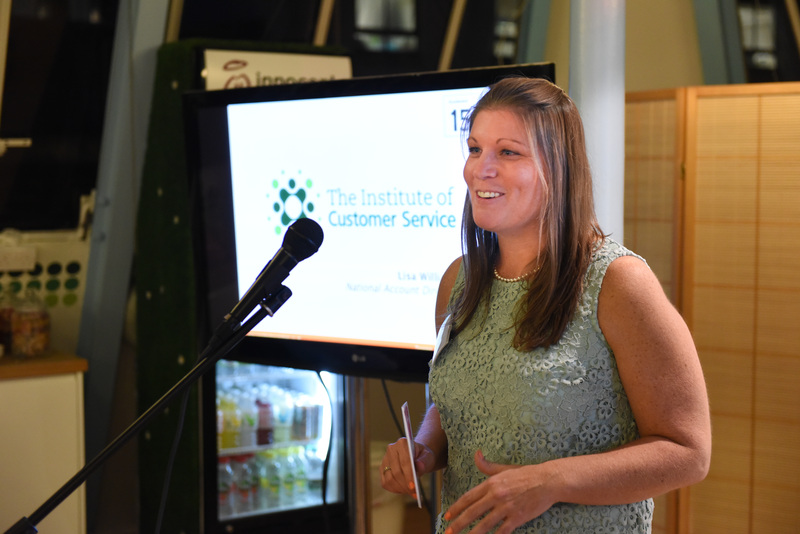 Telling my story at Accelerator’s 15th anniversary. Lastly I am hoping to support a women’s charity that helps to get women back into work which I am really excited about so watch this space. After being inspired by a wonderful friend who unfortunately isn’t here to see how she has inspired me I am pleased that I have been able to doing a little bit of inspiring myself and I am enjoying hearing the stories of how I have done so. The last few months have been some of the most humbling of my life… thank you. There are a few more interviews which I have done which will be coming out of the coming months but for now I am packing my bag and heading to the sunny shores of Tobago for some well earned rest and some possible warm water swimming and reflecting on a great summer. Till next time… be inspired and pass it on! On Friday 14th August I had just sat down for dinner when I got a text from my pilot Eddie saying ‘Can you swim this coming week’, this was the third time Eddie had asked if I had wanted to go early, the other two times I had been in Zurich and then was in the middle of moving house so it hadn’t been possible. I had spoken to Eddie the year before saying I would like to go early as I had been worried about the weather in September and the possibility of having to be carried over to next year. Eddie has said that the possible opportunity was to go Sunday night/Monday morning. I had been ready to go but had a concern, would my crew be able to still come? I knew that Brian was at that very time sat on a plane waiting to take off to Tanzania and Abby might have to work so wanted to talk to them first before I made the decision. Brian had supported me on this journey since the beginning and so it was hard to speak to him to see if he would mind if I went without him, I felt pretty sad about it but knew that you have to take a weather window when you can. Abby said she was able to move something around and join me, great! I couldn’t let Abby crew on her own, although she had crewed for me for my two way Windermere swim the month before she hadn’t been around the open water swimming world so wanted to find some other support in case she needed it. My first text was to Emma who had crewed for my 1 way English Channel relay 2 years before, she was absolutely amazing then and would be great to have on the boat, my text said ‘how would you feel about crewing for a solo on Sunday/Monday’. All she came back saying was ‘if it is you then yes’, BRILLIANT. I text Manda to tell her there was a possibility that I was going on Sunday and that Brian was sat on a plane and to my complete surprise she asked if I wanted her to come along. HELL YEA! I couldn’t believe how easily it fell into place, I had been expecting a few hours of trying to find someone. Manda and I have swum together for about 5 years and had she had been the person who had set up the winter challenge and our dip and dines so knew me as a swimmer well. Perfect, crew complete… Eddie I will take the slot! The next day I headed off to the supermarket with Abby to get all the supplies bought, food for crew and me and then had a comical hour drilling holes into plastic cups ready for reels to be able to feed me. I had been so busy that I hadn’t had time to think about the swim, which was probably a good thing, it was 3 weeks before my swim was due to go and I had been so emotional recently that I was starting to wonder if I had the early menopause. I’d decided not to tell anyone on social media and only a few friends for two reasons, one if the weather changed and I didn’t get to go in the end and secondly because I wanted a good night’s sleep. Everyone had been so supportive throughout my Channel journey that I knew the messages would come pouring in so I decided to leave it until I got a text from Eddie the next day to say that I was definitely going. We were to meet Eddie at 11pm on Sunday at Dover Marina and with a plan to start swimming at 00.30 Monday morning. As most know I don’t like swimming at night so I tried to look at the positives in the situation, I wasn’t going to be having to swim into the night and it was only 4-5 hours at the beginning when I would be at my strongest. We boarded Anastasia and Loretta my observer (from the Channel Swimming & Pilot Federation) went through the rules as we motored around to Samphire Hoe beach. Manda & Emma lathered me in Channel grease and suntan lotion (felt a strange thing to be doing at midnight) and I was given the instruction to swim ashore ready for my swim to start. It seemed weird after all this time that it was finally going to happen. So at 00.32 my swim started and I swam from the beach toward the boat. My team had lit up the boat with lots of coloured glow sticks and had them around their necks so I could see them moving around the boat or standing there watching me. It was evident that they were doing everything they could to make me feel as comfortable as possible in the water, all three of them had torches shining on me and if I moved forward one of them would move up the boat with me, I remember at the time thinking ‘I have the best crew on board, they are complete stars, what more could I ask for’. I remember the water being cold throughout the night and wishing the sun to come out. My feeding strategy was to feed hourly for the first two hours to try and get going and then half hourly moving forward, it became evident that I was taking too long on my feeds as the crew stopped feeding me treats (jelly babies, chocolate, or peach slices/banana) and just gave me the carb drink, I found out later it reduced my feed time from over a minute down to 12-16 seconds. Funnily when they offered it to me later on I declined, it had been making me feel a little unwell and the carb powder with summer fruits squash was going down okay. After about 5 hours the sun came up and I started to settle a bit more, throughout the night I had seen all the ferry lights going past around me so it was nice to be able to see things in daylight. I had an idea where in the Channel I was and went through 10/15 minutes or so of what I called ‘Jellyfish Alley’ I only saw compass jellyfish, they were brown and mean looking with long tentacles, there were lots below me and I pulled my head up a bit in the water so I could see any coming towards me and started swimming as if I was on the dodgems trying to avoid them. Amazingly I didn’t get stung and then next minute Loretta shouts out to me ‘swim out swim out’ I looked over and saw loads of seaweed… ‘Seaweed Lagoon’ avoided and on I go. The crew had been busy showing me lots of messages from friends and family on a white board and it was lovely to see everyone’s messages coming through, the advice from my nephew to ‘swim backstroke it is easier’ made me smile, little did I know I was going to heed his advice later on. 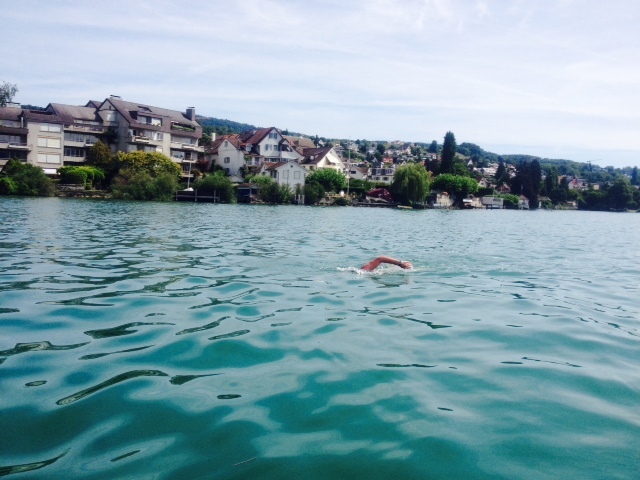 My head had started playing games with me and I had thought I had been swimming for about 14 hours and seemed miles away from France when Loretta shouted out to me, ‘you’ve only been swimming 10 hours it isn’t even a training swim’ it was amazing how I picked up my pace again because of those few words. A little while longer I started feeling shooting pains under my shoulder blade in between my ribs, it started getting progressively worse and I could see Loretta trying to tell me to stretch out my arm, I tried but it was causing too much pain. 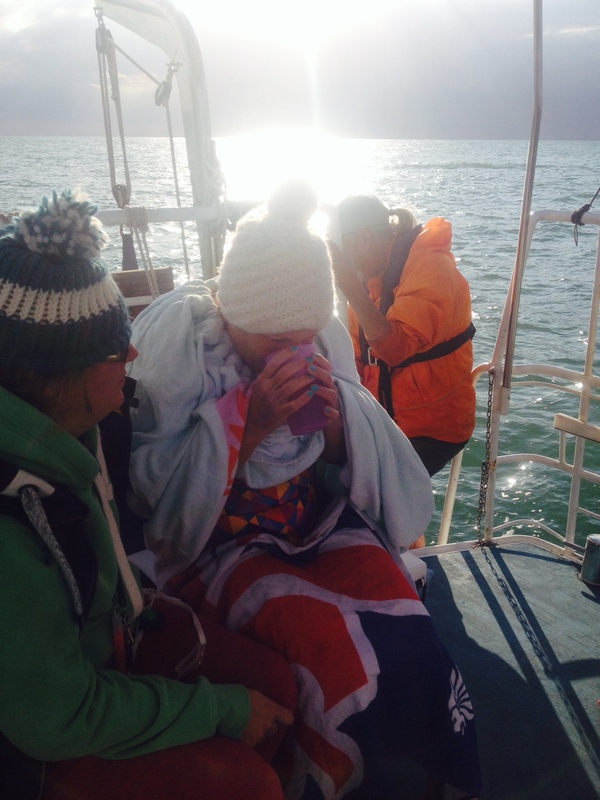 Next feed I was told to give it a hard push for an hour, I knew what this meant, if I swam hard I could hit Cap Gris Nez (I found out that it would have been an under 12 hour swim if I had) but with the pain I could feel myself struggling. I started thinking of my friend Elaine who I was swimming in memory of, I dug deep and tried to blank out the pain and swam as hard as I could determined to hit the Cap. I looked up at the feed and it was so close, I was so happy. As I started swimming again though it seemed to disappear and at my next feed I asked if I had ‘missed it’. It appeared the wind and weather had turned and a few minutes later the tide turned and started pushing my back out again but Loretta told me Eddie was going to take me into just the other side as we had only just missed it. In my head I knew I had hours left of swimming left now and for a few short moments I thought about throwing in the towel. I knew the pain wasn’t going to get any better and the swimming wasn’t going to get any easier, could I do this? In my next feed I asked the boat ‘am I going to be able to land at some point’ and Loretta shouted back ‘Eddie will land you’. That was all I needed and I swam on. The pain in my ribs in my back kept getting worse and worse and I knew I had to do something to try to ease it so I started swimming backstroke and then one armed front crawl. I could see Wissant beach ahead of me and thought yes I am going in – I had landed here two years before for the one way relay. However, it never seemed to be getting closer, I really started to worry now. The pain was getting worse, I had been asked to give it 100% (which was tough to hear when I felt I had been already for the last few hours) and again knew that it meant the tide was doing something. I was having to dig really deep here and was telling myself that there was no way after 2 years that I wasn’t going to land, it wasn’t an option. If I could swim for this long then I could do much longer if I had to but would my injury let me carry on? I couldn’t understand why the beach wasn’t getting closer, I found out later that I had got caught up in an eddy and was being pushed back to towards the Cap – when you are in the water you just swim, the crew don’t tell you where you are or what is happening but I did get very confused when I looked up and saw the Cap again – I had been so close to this point 5 hours previously. The RIB was launched and I knew that was the cue that I was going in to land, I was going to do it, this was finally it, I still didn’t know where I was going to land but I was going to land. I could hear Eddie playing ‘Rule Britania’ over the loud speakers; the French must think we are barmy! They kept pointing towards the rocks so I swam in that direction and saw a double kayak pass by – was it a mirage or was this indeed human life? After 17 hours and 19 minutes I finally touched the rocks on Cap Gris Nez, I had done it. I got hauled into the RIB back to Anastasia and burst into tears, the pain was over. Oh and I had become a Channel swimmer! I had never expected the swim to be this hard, I had enjoyed bits & hated bits and had many highs and lows and had been cold throughout but I had never given up believe that I was going to land. After all if you want something badly enough and you give absolutely everything then you can achieve it. It is still taking time to sink in that I have become a Channel swimmer but I have been overwhelmed by the amazing support I received throughout and after. My two reasons for doing the swim were firstly in memory of a wonderful friend Elaine who had lost her battle to cancer 2 years prior – I thought about her a lot during the swim and it helped me numerous times to dig deep and secondly was to inspire others to do something different with their life’s and realise you can achieve things you never thought were possible with a bit of hard work and determination. I could never have dreamed when I started on this journey that I would have raised over £7,000 in memory of Elaine for the Royal Marsden, but she deserved nothing less so all the pain and hard work has been completely worth it and asked would I still have done it if I knew what I would go through – ‘hell yes I would’. Thank you so much to Abby, Manda & Emma for being amazing throughout, it was funny listening to the stories from the boat afterwards and you can read a blog from a crew’s perspective here. I 100% had the right crew on board and know that with a different crew it might not have worked out – they were brilliant in every way and will always be the people whom without, I may have been telling a different story. Also a big thanks to Eddie and the Anastasia gang & Loretta, they made this all possible and at no point chose to pull the swim despite seeing the pain I was in and how much longer I had to swim. I also have to thank all the many people over the years from the Channel swimming community who have given me their time and advice many of which have become great friends. As well as my Channel training partner Kerry who has been such great support when I had been going through huge lows and doubted my ability to swim the Channel and constantly reminded me about the things I had already achieved. I will be with you every stroke of the way for your own swim. Big thanks to Franco, my lovely Osteo from Natural Health Chiro who has looked after my back and shoulders throughout the year and ensured that I have been able to train without injury for the whole year. And lastly thank you to all of you who have supported me with numerous amounts of support and donations, you have no idea how much it helped me.